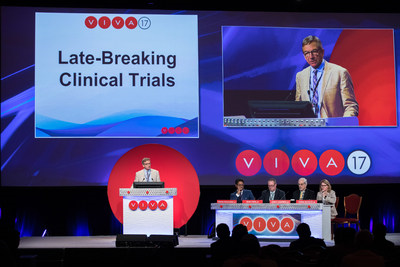 LAS VEGAS, Sept. 12, 2017 /PRNewswire-USNewswire/ -- VIVA Physicians, a not-for-profit organization dedicated to advancing the field of vascular medicine and intervention through education and research, announces the second five of twenty 20 highly anticipated late-breaking clinical trial results at VIVA 17 hosted at the Wynn Las Vegas. Presented by George Adams, M.D. DANCE enrolled 262 subjects, with 157 limbs revascularized using atherectomy and 124 limbs receiving angioplasty. The preliminary 2-year primary patency rate is 72.8% and freedom from CD-TLR was seen in 85.2% of subjects. There was no loss of patency seen between months 24 and 25 as the analysis window was closed. Two-year results from the DANCE trial ATX group provide the largest, long-term data set of patency rates in atherectomy subjects with adjunctive local drug therapy. Presented by Wei Guo, M.D. Two hundred Chinese patients with peripheral artery occlusive disease were prospectively randomized to treatment with the Orchid drug-coated balloon (DCB) or an uncoated balloon catheter. The primary endpoint was angiographic late lumen loss at 6 months, which was 0.05 ± 0.73 mm for the DCB group and 1.15 ± 0.89 mm for the uncoated balloon group. After 24 months, the freedom from CD-TLR rate was 86.5% vs 58.6% (P < .05). There were no significant between-group differences in the rates of death and major amputation (9.4% vs. 9.6%, P = .98). AcoArt I demonstrates safety and efficacy of Orchid DCB in treating femoropopliteal artery disease. This prospective, multicenter, nonrandomized, single-arm trial is one of the largest prospective series to evaluate the percutaneous treatment of femoropopliteal blockages with lengths of 25 cm to 45 cm. The primary patency rate was 88.9% at 6 months with optimal device placement, and an overall primary patency rate of 76.9%. Delivery of devices and removal of the delivery system was successful in 100% of lesions. Improvement in Rutherford class of at least two grades was observed in 92% of patients; 94% of subjects improved ≥ one class over baseline at 6 months. Presented by Darren Schneider, M.D. This retrospective study utilized the IBM Explorys research database, which contains longitudinal patient data for approximately 55 million U.S. patients since 2012. Clinical outcomes and complication rates were compared among patients undergoing closure of large-bore arterial access using the Perclose ProGlide suture-mediated closure system (Abbott Vascular) versus surgical cutdown. A multivariate analysis showed significantly lower complication rates for Perclose patients. During the hospital admission for the procedure, Perclose patients were 80% less likely to require a blood transfusion and 41% less likely to have an infection. In addition, the mortality rate at 30 days was 70% lower among these patients. The average hospital length of stay during the index procedure was significantly shorter for Perclose patients (5.1 days vs 9 days; P < .001). Presented by Scott Trerotola, M.D. This randomized trial enrolled 285 patients with dysfunctional AVF. After successful percutaneous transluminal angioplasty, lesions were treated with either a Lutonix DCB (Bard Peripheral Vascular) or a control uncoated balloon. The primary safety endpoint was met and did not differ between groups. The 6-month efficacy endpoint was not met with target lesion primary patency (TLPP) of 71% for DCB and 63% for control; however, at the end of the 6-month window, TLPP was superior for DCB (64% vs 53%, P = .024). Interventions to maintain target lesion patency were fewer for DCB at 6 months (44/patient vs 64/patient; 31.3% fewer reinterventions). At interim 18 months, the survival curves remain separated with a 37% improvement in TLPP over control.